Barney #4700 - Yankee Golden Retriever Rescue, Inc.
Barney was 5 years old when his family could no longer give him the time he needed. His family wanted him to get the exercise and attention they couldn’t provide, so after looking into all their options, Barney was soon on his way to YGRR. Barney was a healthy boy except for a slight ear infection. He was soon settling in to the routine here at Riverview. Barney was very happy to get the attention he had been missing. He enjoyed being in the play yards and was good with the other dogs, though he really preferred people. He explored the trails with our dog walking volunteers and he loved to pull all of the toys out of the toy box or relax on the couch in the adoption room. Barney was a sweet, happy boy with a true Golden personality. He needed a special home where he would get the attention he had been missing. 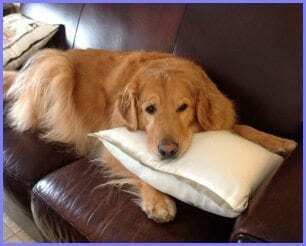 It didn’t take Barney long to find the perfect new home with an experienced Golden owner. Now Barney gets all the attention a Golden could ever want. He loves to go for long walks or hikes, either in the woods or on the ocean. He mischievously parades around with the couch pillows, but that is just fine with his adopter! Barney is now a home visitor for YGRR, and he is paying it forward by helping other dogs in need to find their own perfect homes. Barney’s adopter says it is a match made in heaven, and Barney whole heartedly agrees! Barney thanks you for your support. Your generosity allows us to get to know each dog that comes to Riverview so that we can match them with the perfect new home. The dogs are given whatever veterinary care is needed upon arrival. When they come to our adoption facility, Riverview, they are professionally groomed and given their own space with a bed and safe toys. They spend time going for walks, romping in the large, grass play yards, or pulling out toys in the adoption room. We treat every dog like our own. You make this possible. Barney and all the Rescue dogs thank you and send big wags and kisses your way!